With each update to the PreSonus StudioLive series, the pro audio world takes notice. This, the third-generation StudioLive 16 digital console, brings you into the future of digital mixing with a plug-in-style signal-processing workflow that features studio-quality, vintage-style EQ, and compression options on every channel. The StudioLive 16 delivers virtual soundcheck without a computer and onboard multitrack recording to SD Card; just record one good whack to the snare, toms and kick, and let the drummer go get a beverage. You can now engineer a great drum set mix and EQ without the drummer having to be there. Incredible. If you know this mixer, then you know the intuitive and customizable Fat Channel views and channel layers. Another update this year is the comprehensive software package, including PreSonus Studio One Artist DAW, that will give you a completely integrated experience both on stage and in the studio. 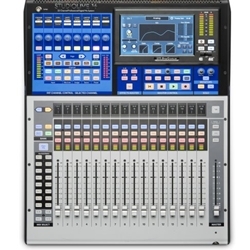 PreSonus third-generation StudioLive 16 digital console is fully recallable, with touch-sensitive, motorized faders and recallable XMAX preamps. Yet it retains PreSonus legendary ease of use, with a fader for each input channel and 1-to-1 workflow, and adds new customizable Fat Channel controls. Its studio-grade sound is enhanced with all new Fat Channel processing, including a plug-in-style workflow that features vintage-style EQ and compression options on every channel. You get 16 FlexMixes that can be Aux, Subgroup, or Matrix mixes; 6-band fully parametric EQ on all mix outputs; 24 DCA groups; and built-in AVB networking. In addition to 40x40 USB and 55x55 AVB recording interfaces, the StudioLive 16 features an onboard multitrack SD recorder with Capture one-touch recording, true virtual soundcheck, and mix scene transfers to Studio Oneâ€”without a computer.